This card is for a couple of challenges over at Splitcoast today. First the CAS220 challenge to let your image portray your sentiment on your card. 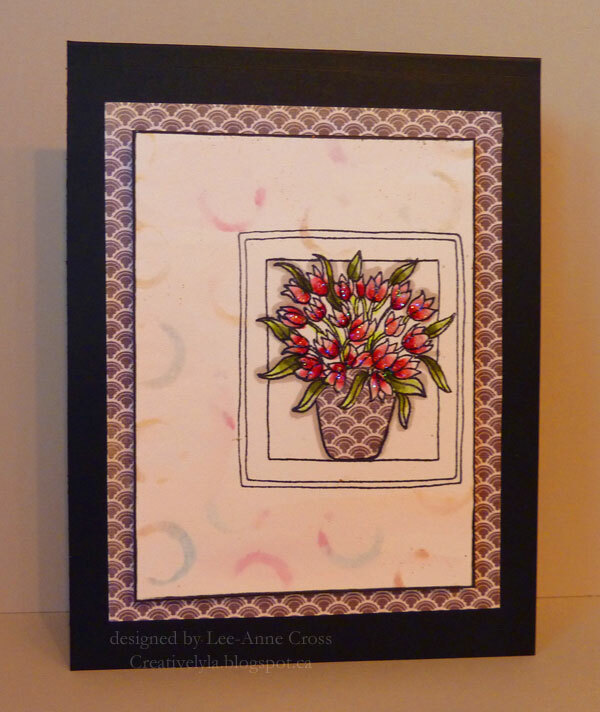 This floral image could be used for many types of occasions…birthday, anniversary, get well or sympathy. And secondly for the TLC429 challenge to use the bokeh (pronounced bo-kay) technique on your card. So now you get my little play on words for my title today *grin*. I’ve stamped the image on some watercolor paper and used the marker layering technique to color it. Then I paper-pieced the vase and outlined the image with a Copic marker. Next to get the bokeh effect, I used a TCW template and added some color with my ink blending tools. I only used what color was left on the sponges…didn’t actually add any because I wanted a really soft look. Then I used my waterbrush to blend and lighten the colors even more. The focal piece was edged with a Big Brush Pen and layered on the designer paper with dimensionals, then added to the card base. Have a wonderful week! See you soon with more! That soft background is really pretty Lee-Anne! Nice play on words Your card turned out fabulously!